"The largest, grandest and most expensive chapel built in Wales" - Anthony Jones' description of Tabernacle, Morriston, in his 1996 definitive book Welsh Chapels which features the iconic Grade 1-listed building as its cover-photograph. Victorian industrialisation brought rapid population growth to the lower Swansea Valley, close to the port of Swansea, as rural workers sought new employment opportunities in many tinplate and copper works established in the area. 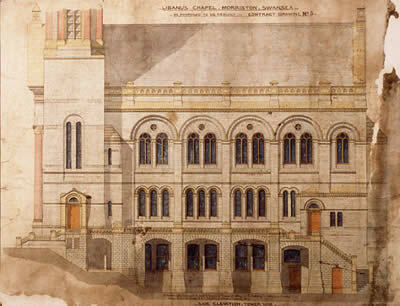 Welsh Nonconformity enjoyed great popularity; a dozen chapels were built in the Morriston area alone in the latter half of the nineteenth century and Tabernacle, planned as the ultimate evocation of a Welsh chapel in terms of architecture, space and facilities, was completed in 1872 at a staggering cost of £18,000. A rare photograph shows the building shrouded by timber scaffolding as construction reached the base of its 160ft spire. The design was evolved by three prominent figures in the area: the minister, Emlyn Jones, the architect, John Humphrey and the contractor Daniel Edwards.They undertook a tour of Britain to see the newest and best chapels and returned to assemble a grand collage of the elements they liked best. Although the facade, with its eight huge Corinthian columns and arches, predominates, the other three sides are also designed in detail. The interior, an impressive display of the carpenter's craft in the so-called Age of Mahogany, is of equal quality with its downward-swooping choir gallery and distinctive three-case organ. The Cambrian national newspaper described it as "the one great redeeming feature in that manufacturing district, an oasis in a desert". The heavy industry is no more, but the visual impact of the building, its spire visible for miles around, remains undiminished. The church members, some 800 in 1872, relocated to the new building from a nearby chapel for lack of space; following the fervour of the 1904 Revival, membership at Tabernacle peaked at 1059 in 1910. 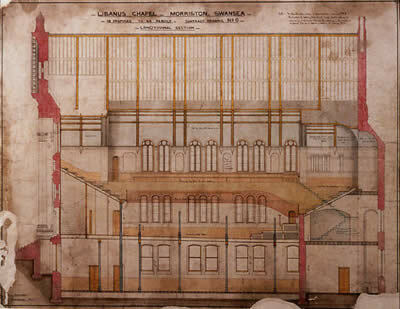 The architect's drawings indicate that it was intended to retain the name of the former chapel at the planning stage, however the foundation stone bears the name Tabernacle. Emlyn Jones' pioneering work was followed by long ministries by two figures of national stature: J.J.Williams (1915-1944) poet and Archdruid of Wales 1936-38, and Trebor Lloyd Evans, writer and historian (1945 - 1964) who worked tirelessly to revive the Welsh language, then in rapid decline, and campaigned to establish the first Welsh-language school in the area. Although membership now stands at 144, the congregation has worked tirelessly for nearly twenty years to match- fund grant-aid by CADW, the Welsh Government's Historic Environment Service, thereby securing the structure of a magnificent Victorian building for future generations. In the meanwhile the chapel and its ancillary spaces host local cultural groups, weekly choir practices by local choirs, activity days for the disadvantaged and disabled and, of course, regular Sunday services. Rapid social change occasioned the building of Tabernacle. In today's world where the nature of change is different but no less rapid, this prominent building is a powerful reminder of the lasting merits of Christian, social and cultural values.